Looking for hops garlands. 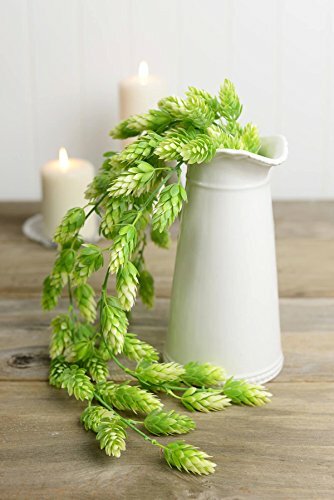 This is a faux hops garland with hints of cream and green. It is 30-1/2" long. The first 7" are wired, after that the branches are soft for a natural hanging look. For a lush garden wedding look, use the Hops Garland to decorate chair backs, or to adorn your wedding arbor. (1) Richland Hops Garland 30"
This is a faux hops garland with hints of cream and green. he first 7" are wired, after that the branches are soft for a natural hanging look.